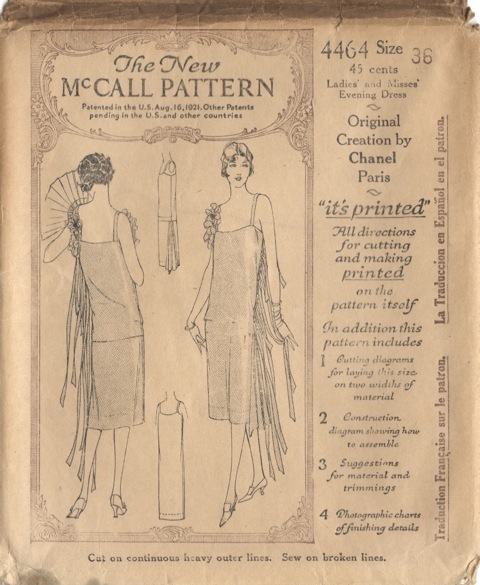 For my Halloween vampire flapper costume I made one of my favourite 1920s patterns in my collection: McCall 4464, an evening dress by Chanel. McCall 4464 by Chanel (1926) Evening dress with slip. McCall 4464 in the McCall Quarterly, Summer 1926. Image courtesy of Debby Zamorski. The short evening dress has a bloused bodice, side drapery on the skirt, “trimming strings” or streamers, and self fabric flowers at the straps. The pattern doesn’t include the flowers, but it does indicate ‘material for rosettes’ on the layout. I skipped them for my version—they may balance the streamers, but I’m not really a rosette kind of girl. McCall 4457 and 4464 in the McCall Quarterly, Summer 1926. Image courtesy of Debby Zamorski. I used the same black satin for the slip and the dress. The only alteration I made to the pattern was to grade down the bust by one size. I also shortened the straps, guided by the ‘natural waist’ mark on the slip front. I was surprised by how flattering the Twenties tubular silhouette can be. And comfortable: leaving the house, I had a brief moment of panic, feeling like I’d forgotten to get dressed. (I realize a foundation garment would have been worn during the period.) I think I’ll be re-making this one—maybe I’ll even venture some rosettes. Next: My 1920s vamp wrap. Halloween costume? You look fabulous and the dress is incredibly beautiful. I love your look hair Sarah !! I love this period- altho it doesn’t suit my hippishness! You look lovely and I can’t wait to see the wrap! Thank you! You know, I wasn’t sure about the hip issue myself, but I now think the Twenties silhouette doesn’t require ‘boyish’ narrow hips. 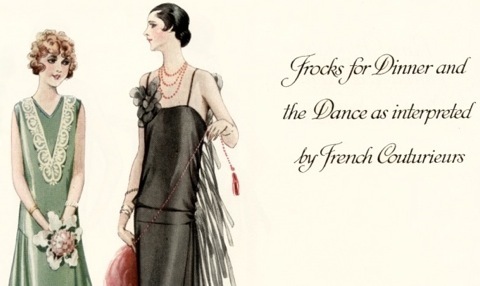 If you love ’20s fashion, I suggest you give it a try—you might be pleasantly surprised.. Your dress is gorgeous! So glamorous. Definitely one of the most amazing things I’ve seen made up for ages. Beautiful!! I’m really taken with the dress. 🙂 Great job! Would you show us the pattern pieces? I would love to see the details. Great dress and you look wonderful! Lovely job. If you ever make it again, you might consider producing it in Chanel’s illustrated vision: a silk slip (probably in a blush or flesh tone) under a black (or other color) chiffon over-dress w/ chiffon “ribbons” & “corsage” — very summery. Your silk version is a more winter version — perhaps w/ a bit of sequin or beaded accent on the ribbons (possibly just the ends?) and along the neckline and/or hem? Thanks, Mimi. Isn’t HPrints fantastic? One of the interesting things about making the Halloween version was seeing how the design effectively teaches you what it requires.. And I really like the idea of embellishment on the ribbons. 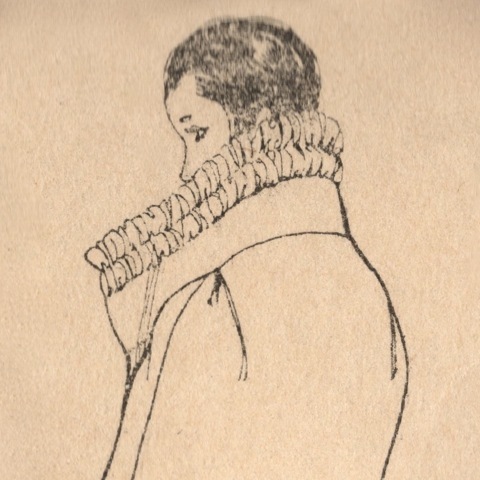 By the way, I’ve already posted about the wrap, which was from a Martial et Armand pattern. There’s a link below the comments, and I’ve also updated this post to link to the wrap post. Like the Chanel dress, it was also a learning experience!